A family of heroes surviving together in an unforgiving wasteland. 46 backers pledged $3,170 to help bring this project to life. 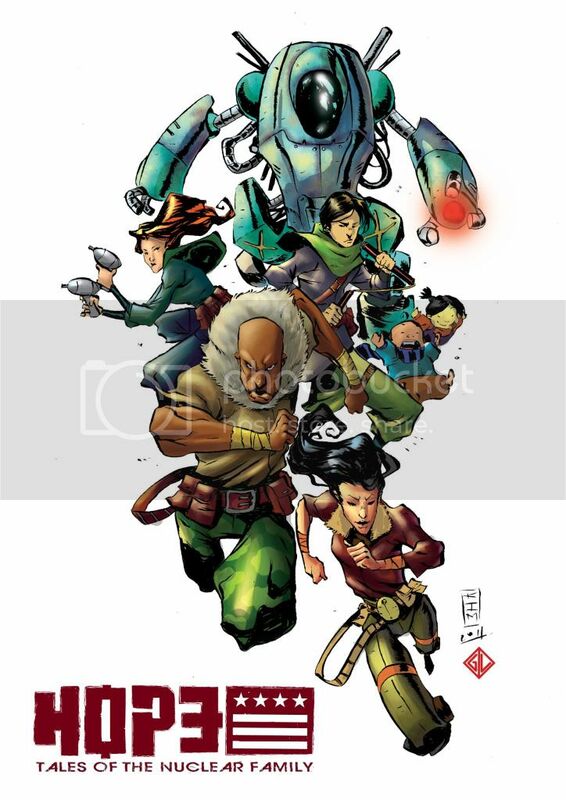 We are creating 2 sci-fi adventure comics and we need your help to do it. H.O.P.E. : Tales of the Nuclear Family (or H.O.P.E.) is an adventure series starring the "Nuclear Family". Our heroes are a uniquely assembled bunch surviving together as a family in an unforgiving wasteland. The story is packed with danger and fun in the vein of 80’s classics such as “The Goonies” and the “Indiana Jones” series. Mom, an experimental super solider. We all know that Mom has always been a superhero! Dad, an infamous mercenary. He has forsaken his past to ensure the future of his new family. Glory, the ultimate teenage wasteland survivor. The 9 year old “Twins” - Jo and Mena, both scientific orphans. Civilization has fallen; nuclear fallout mutants roam and robot armies march endlessly. In this haywire world virtually anything can happen and will. Each of our heroes have survived this futuristic war torn world to together become a new family unit. Beneath their incredible adventures the story explores the bonds of love and family. There's me, Raymond, the writer and creator. I created H.O.P.E. about four years ago and have been working to produce the series for almost a year now. I've always been inspired by the creativity of comic books. The H.O.P.E. 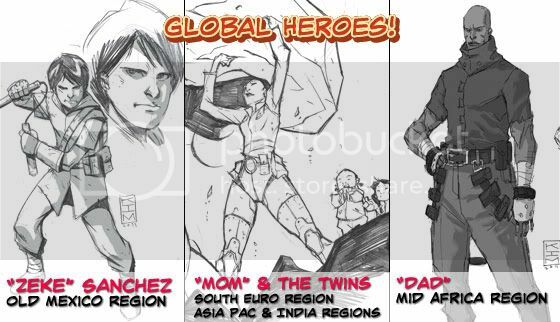 : Tales of the Nuclear Family series also has a solid team of artistis. Rafael Desquitado provides anime influenced artwork to a story called "Broken Hope". This H.O.P.E. special presents our favorite family in a daring rescue against incredible odds. Also on "Broken Hope" we have Aaron James and Fred Stresing providing colors. Jacob Elijah Hallinen came along for the ride with his amazing imagination and brings with him his creative style. Jacob delivers great fun and mayhem in a mini story named "New Toys". The action continues with Kim Jacinto as he delivers the family's ongoing adventures. Beginning with "How Dad Met Mom", a story about… well… how Dad meets Mom. Let's just say it's not your typical first date. Your support will allow us to complete and print 2 issues. Your support will go directly to artist rates for 6 contributing artists, Kickstarter costs and printing. Our Kickstarter goal is just enough to get the comics to readers! Thank you for your interest. For international shipping please add the additional shipping rate to your pledge amount. Our sincere thanks and have your name included on a thank you page on the official web page. The original $1 thank you reward + new Bonus: A PDF copy of the H.O.P.E. special edition preview edition! Have your name (and your kid's name) included on a thank you page within the first comic (get your name in the comic!) and on the web site. 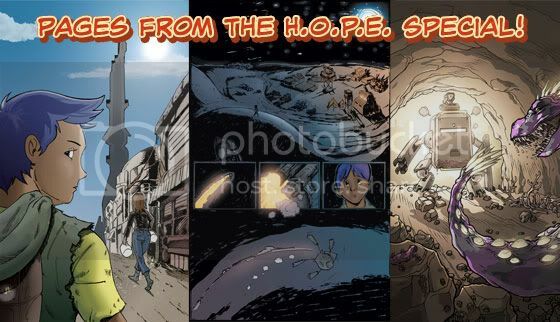 In addition to the original $5 award there is the "Ray loves kickstarter" bonus of a digital copy of a 22 page HOPE story. You support at $5 and you should be able to read the book! Receive a full color H.O.P.E. post card signed by the author and your name included on the thank you pages mentioned previously. You will also receive an exclusive Kickstarter H.O.P.E. desktop wallpaper. + New Bonus: A PDF copy of the H.O.P.E. special edition issue. (Newsstand Version). All of the previous rewards and receive a Kickstarter exclusive PDF copy of issue #1 containing cool bonus material. Only available here! All the rewards of the original $20 buck pledge. Plus the "Ray Loves Kickstarter" bonus of a physical copy of the first 22 page HOPE story. You support at $20 and you should get something in your hand! More, more, more for you! All of the previous rewards and receive a physical copy of the H.O.P.E. special and issue # 1 of the limited series in print. All of the previous rewards and the comics you receive will be signed by the author and creator. You will also receive an 11 x 17 inch full color poster. + You can name a major villain for the rogue gallery! All of the previous rewards and receive a 8.5 x 11 custom and original penciled character sketch. All of the previous rewards and have your likeness appear in a future publication. By pledging this amount you understand you must sign a model release form and provide photo references. 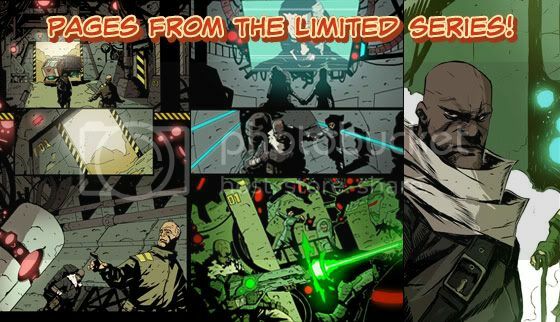 All of the previous rewards and receive a 11 x 17 inch unique and custom penciled sketch, an original page of comic art, an additional 11 x 17 inch full color poster and signed copies of the first 5 issues of H.O.P.E. as they are released. + New Bonus: 20 copies of the first two issues in print all signed by author.